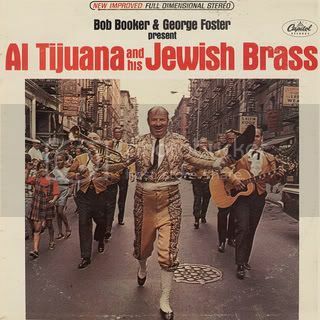 Another exhibit of weird old album covers? I like this trend. 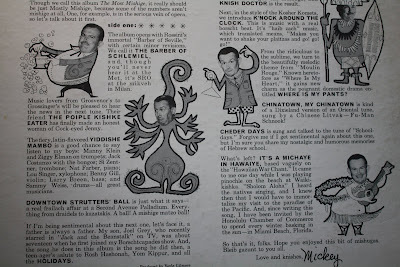 Last year here in Los Angeles we saw the bad religious album covers exhibit, this year, running thru Sept. 5, it's the wacky world of Jewish novelty records of the '50s and '60s. And not in some tiny hipster gallery either, but in the august halls of the Skirball Cultural Center. 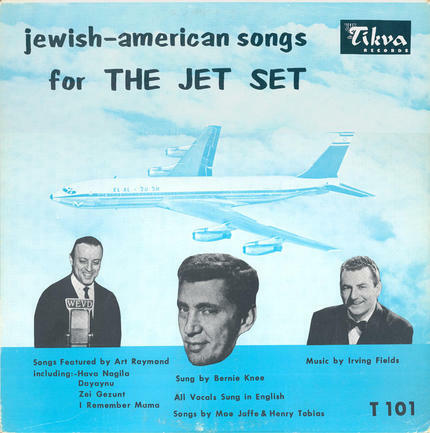 Jews On Vinyl "...was developed in association with the publication And You Shall Know Us By the Trail of Our Vinyl: The Jewish Musical Past As Told By the Records We Have Loved and Lost (Crown, 2008), a project of the non-profit Idlesohn Society for Musical Preservation, which reissues select classic recordings and has created a digital online home for Jewish musical memory in an attempt to restore missing legacies to our contemporary view of Jewish America." 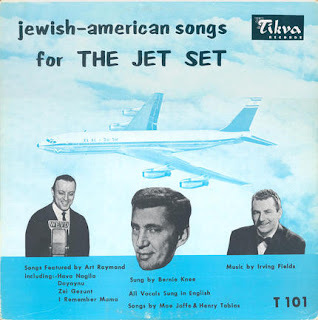 These are the folks who put out the infamous "Jewface" collection we wrote about, and whose blog offers m uch music listening/video viewing satisfaction. 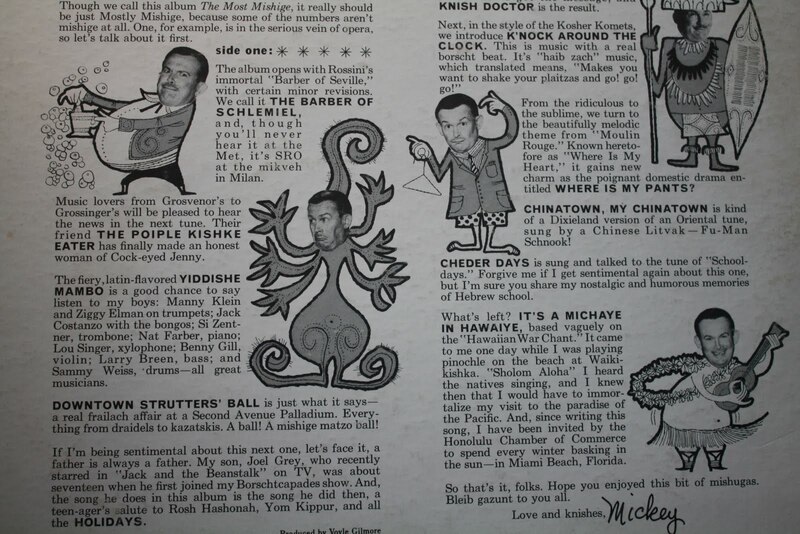 Micky Katz "The Most Mishige"
Like a Jewish Spike Jones, Katz made kosher mincemeat of popular songs of the day thru his zany upbeat parodies, laced with lots of Yiddish words I don't know. His still-teenaged son, future Broadway star Joel Grey sings the track "Holidays." Great stuff indeed. 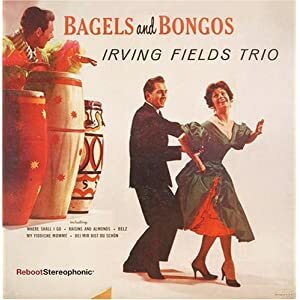 And my cover was in great shape (tho I think I sold my copy) And Irving Fields has a myspace page where you can hear some of his "Bagels & Bongos" Jewish Latin grooves - it's actually in print on cd. Well you have the christians and jews covered. Is there any goodies for satanic pagans or muslims? Funny, that did occur to me too - Xian and Jews back-to-back posts. Just a coincidence. Actually that "Mysteries" album I posted last week might have pagan/satanism covered. 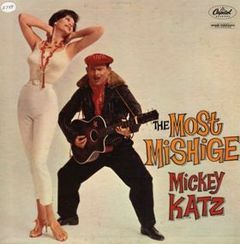 Thanks for sharing the mickey katz album....looks like a good laugh...cheers. HEY! IT'S A CHRISTIAN CHILDREN'S BEACH PARTY!